The quantile plot plots the quantiles of one distribution against the quantiles of another. It provides a visual method of comparing two distributions that is especially sensitive to departures in the tails of the distribution. 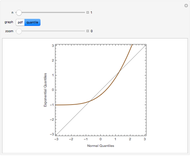 In this Demonstration we construct the standardized sum of unit exponential random variables. 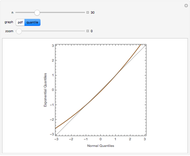 We compare the plot of its probability density function and the quantile plot of its quantiles versus the normal quantiles. At , the pdf plot suggests the tails have converged but the quantile plot reveals that the tails of the sum are still a little bit thicker. The central limit theorem may be illustrated by showing the convergence of the probability density function of the sum of random variables, such as unit exponentials, to the standard normal. The zoom control allows the pdf plot to be enlarged. It is ignored for the quantile plot. The quantile plot may easily be constructed using Mathematica's built-in function ParametricPlot. The quantile plot for comparing two datasets, as in the two-sample problem, is available in Mathematica with the function QuantilePlot. 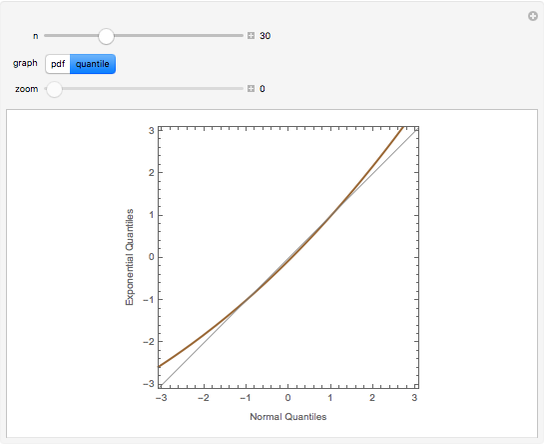 The quantile plot is also sometimes called the QQ-plot and the term quantile plot is used for a plot of , versus , where are the ordered data and is the sample size . Many examples of the use of both of these types of plots are given in . W. S. Cleveland, Visualizing Data, Summit, NJ: Hobart Press, 1993. Ian McLeod "Illustrating the Central Limit Theorem Using the Quantile Plot for Sums of Unit Exponential Random Variables"